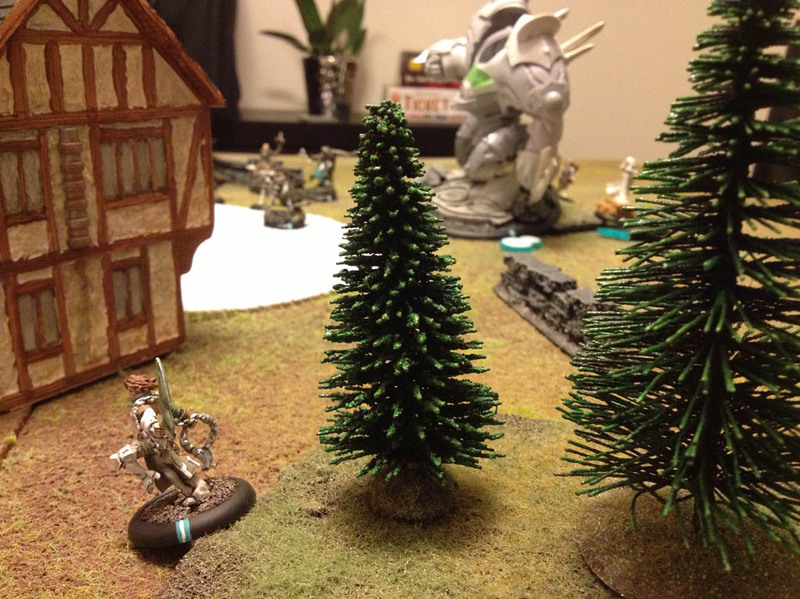 This week I met up with Marc to play a couple of 25pt games in lieu of 1 bigger game. 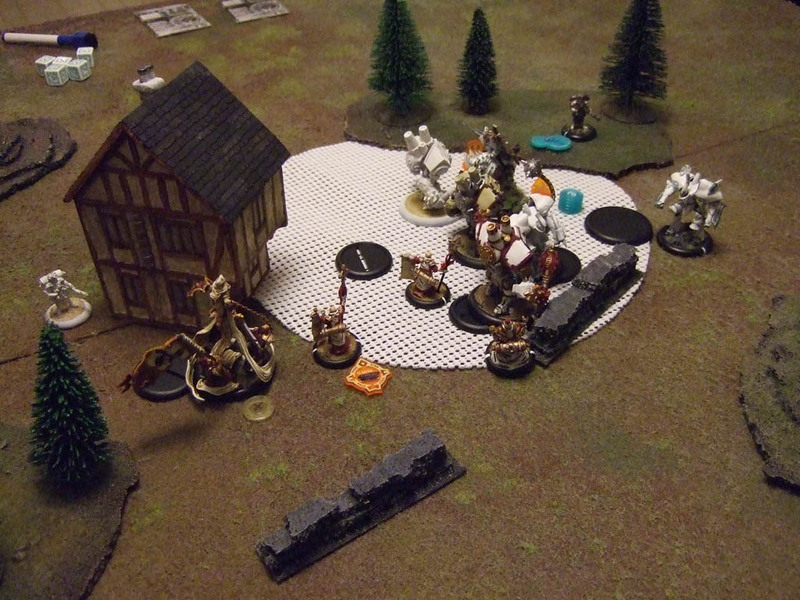 He wanted to try out his shiney new Menoth stuff and I’m always down for a game. 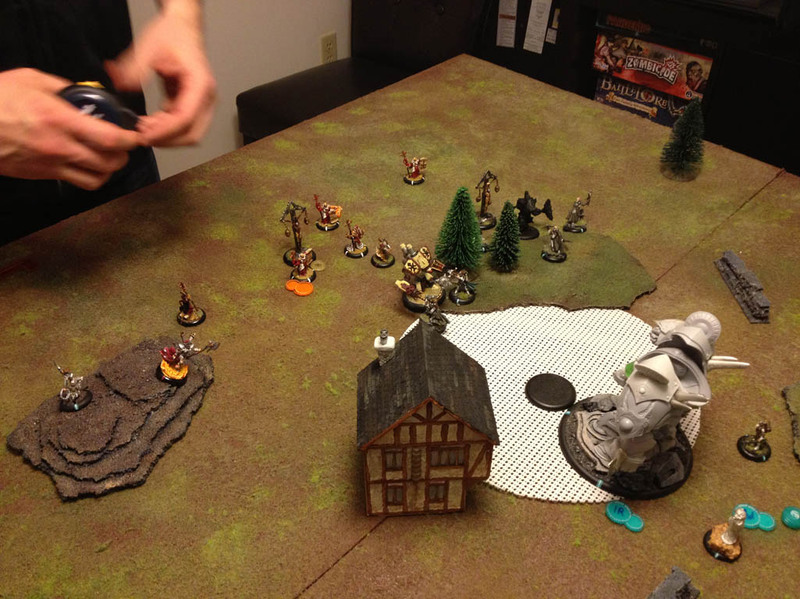 For our first game he brought his Harbinger heavy spam tier list and I brought eVyros and as many griffons as I could fit in a 25 point list. So many in fact that I didn’t have enough griffons to represent them all. 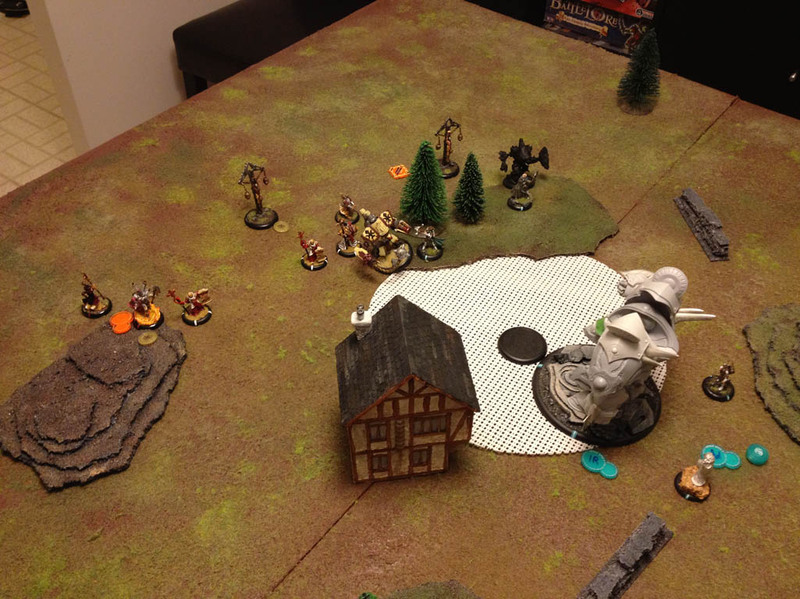 Marc won the die roll and chose 1st turn. 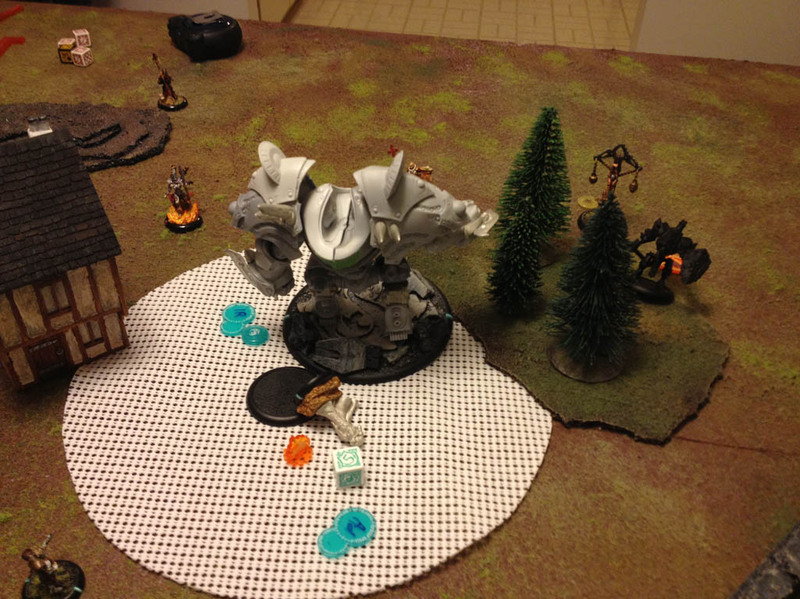 The scenario ,since we were just playing 25 pt games, was just a 12″ circle in the middle of the board. 1pt to control 2 to dominate. In retrospect we could have just played Supply and Demand but we played this so whatever. My turn I don’t see any way to finish it off so Vyros just swings away at his jacks for a turn, doing some decent damage to 1 of them. Next turn Marc remembers heads butts. First jack successfully knocks Vyros down then pulverizes him. start. At 25 point Harbinger can fully fuel all her jacks every turn but probably would have been more strapped for resources at higher point levels. Meanwhile my Vyros list had just enough griffons that Vyros couldn’t run them all but not enough to build up a big enough synergy chain to wreck heavies with ease and no points to be able to take a heavy to anchor. It was certainly an interesting experience I’m sure the game could have gone differently if I had not been so aggressive with my Griffons on turn 2.Even with crusaders call I still out-threated his jacks by 1.5″ so I might have had better success to bide my time a little bit. 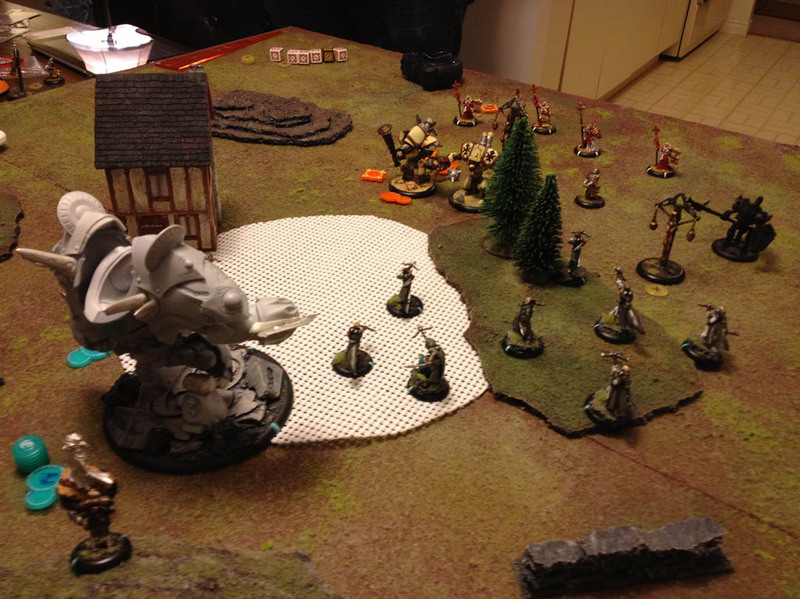 Anyway, fun game, and Nick managed to make a fight of it… helped slightly by some remarkably sub-par damage rolls (my Feat turn was particularly lackluster… Dice-4 damage on the Griffons and I think I managed to damage a grand total of ONE of them), but he really did do a good job with the tools he had available! The first game went by reasonably fast since we were playing at low point level and using timed turns, so we decided to go at it again. 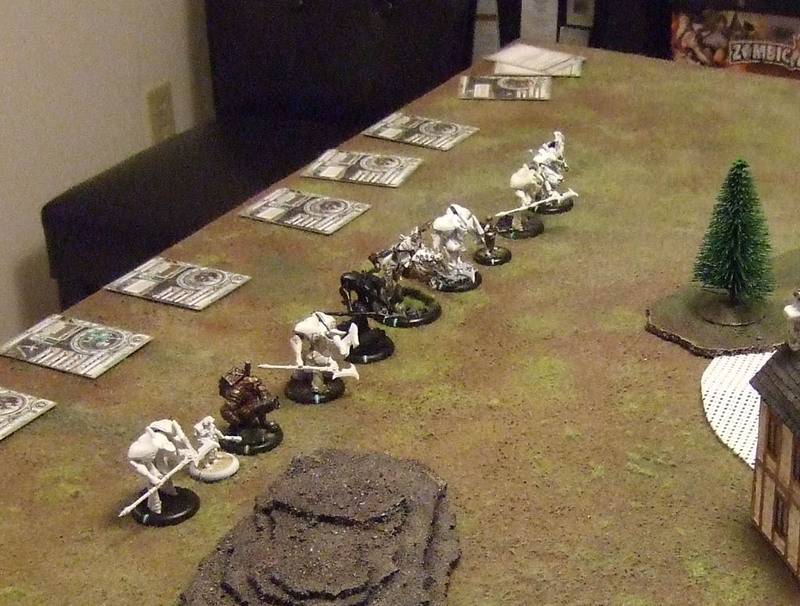 This time I brought a 25 point Issyria list and Marc brought eFeora. I win the die roll and go first. 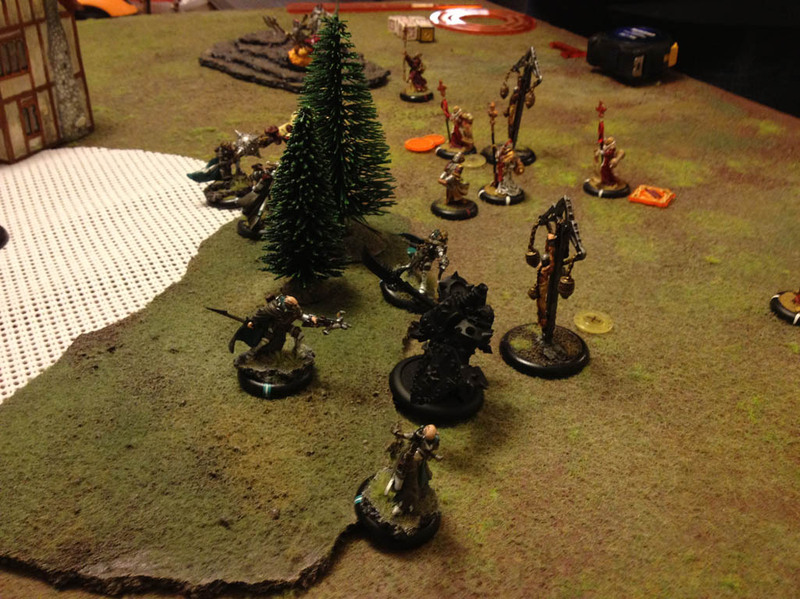 Hyperion goes in the middle with Issyria and the arcanist. 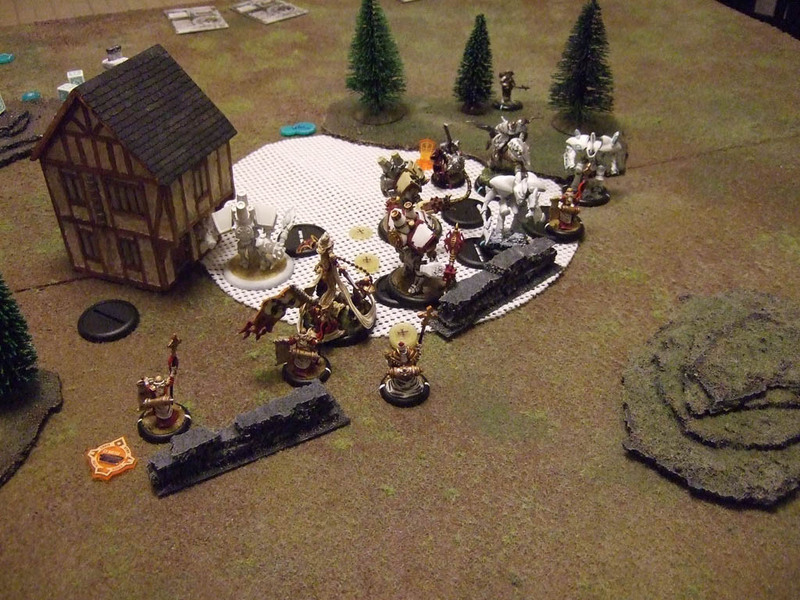 MHSF takes the right flank and MHA takes the left. 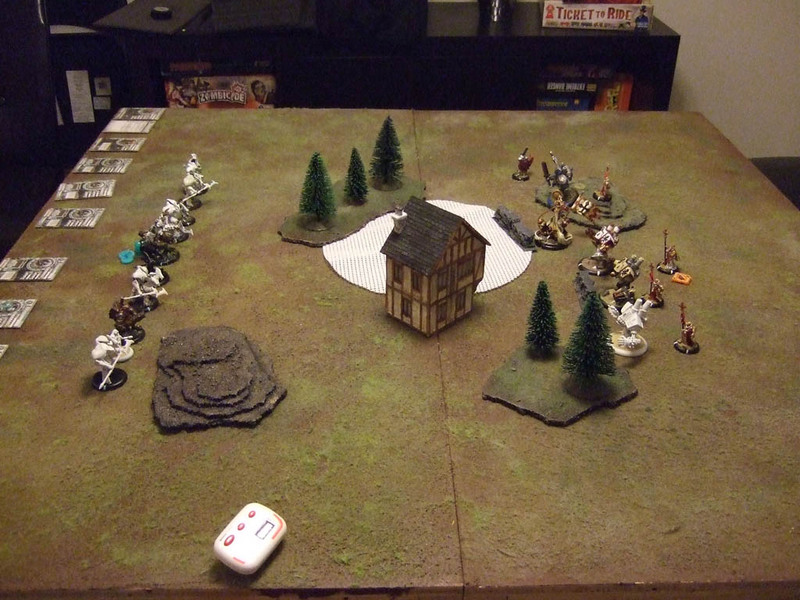 Feora lines up int the middle with the reckoner on the left and the Vanquisher on the right and the Revenger to the far right with support in behind. 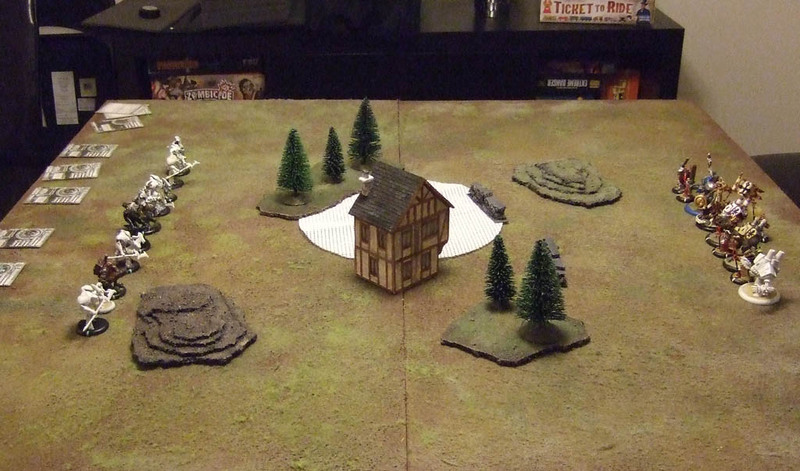 Strike Force run up and spread out as much as their CMD9 will allow. 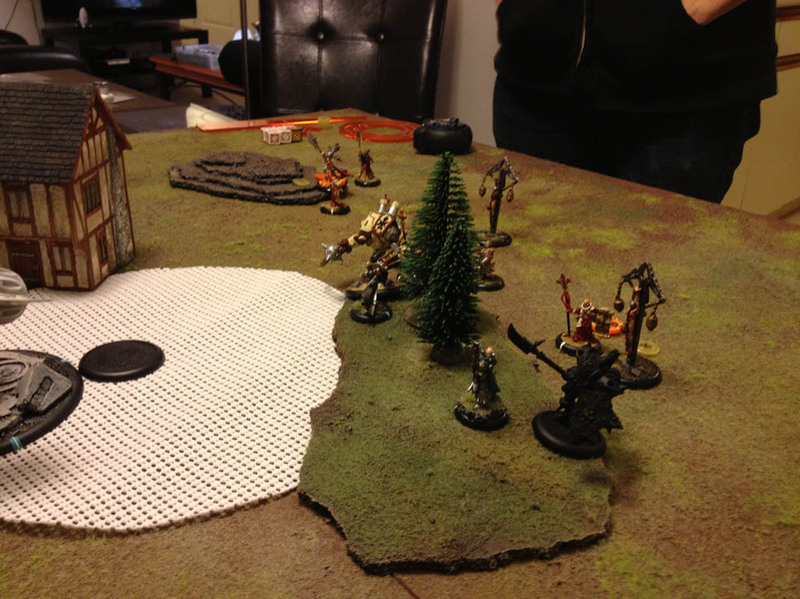 Hyperion runs with arcanist focus. Issyria puts IR on Hyperion and admonition on herself. MHA runs up and toes into the forest. 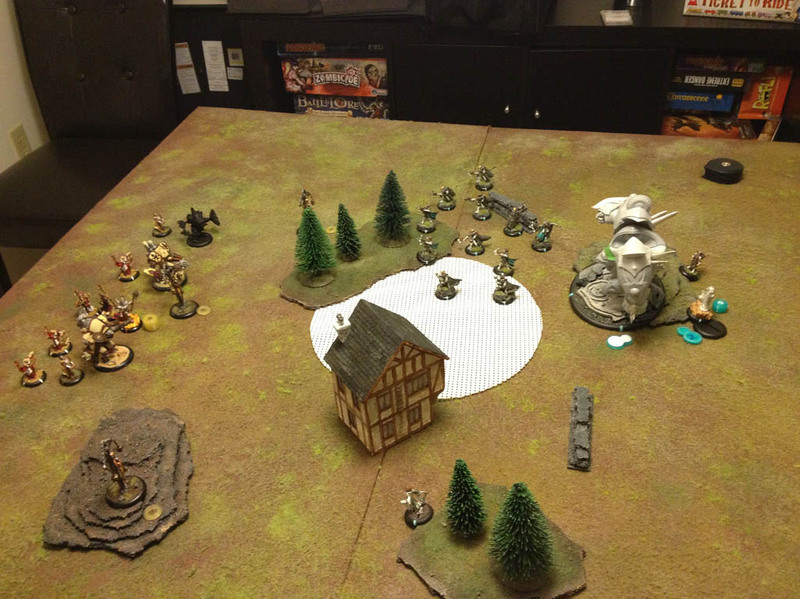 Forgot to take pics of Marc’s turn 1. Basically his stuff just moved up the board He kills 3 MHSF with AoEs and the choir sings Passage. Issyria gives 3 focus to the Hype train. 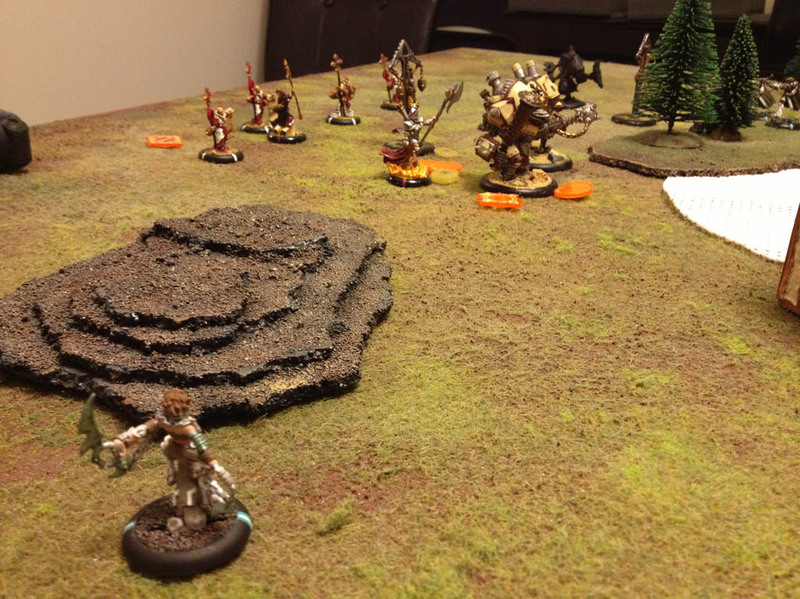 The arcanist moves up and repairs for 6 (Yay! That never happens) and he moves up and crushes the Reckoner handily. 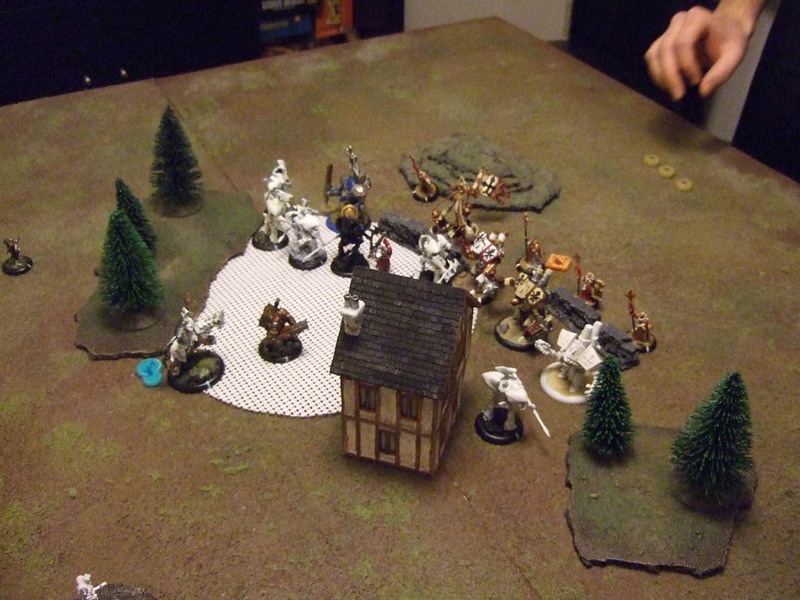 The Strikeforce charges 2 on the vanquisher and 3 on the Revenger. They do light damage. Against my better judgement the MHA charges Feora and predictably missed her. The choir charges and actually kills a MHSF. 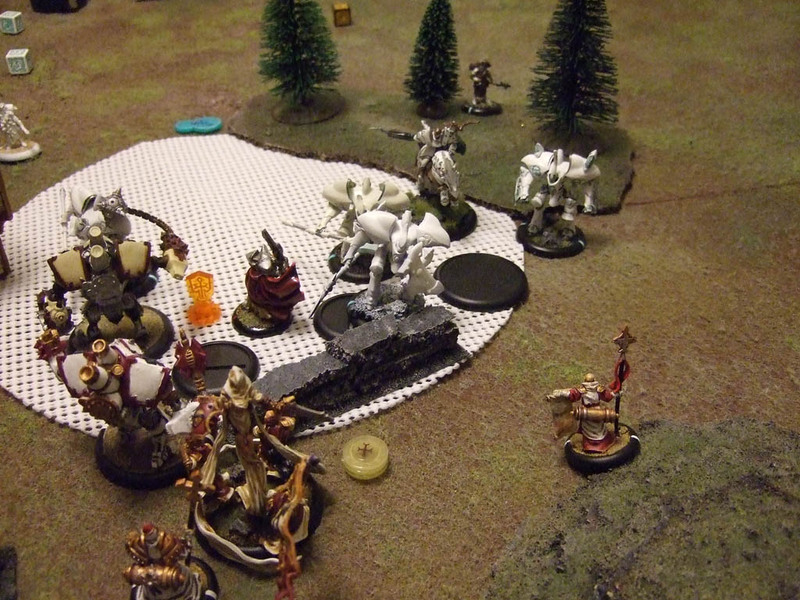 The Vanquisher whiffs on the one engaging him including the ancillary attack. 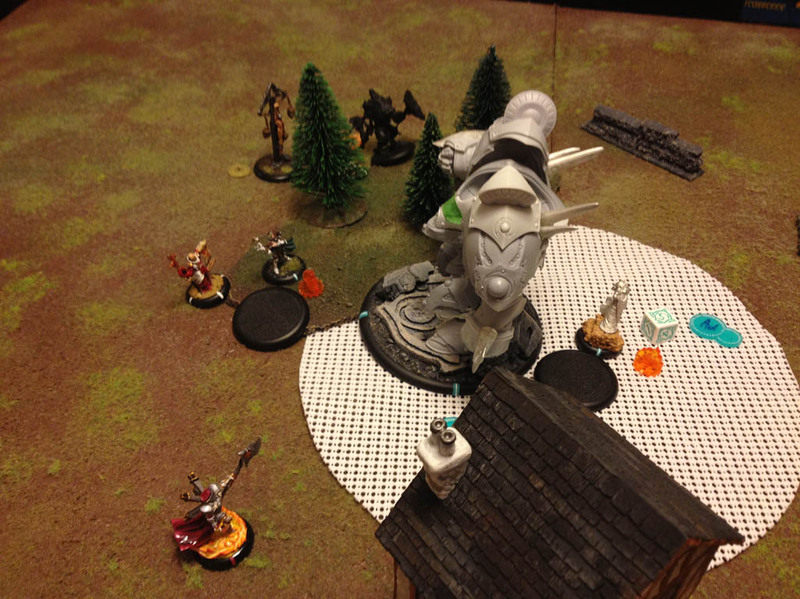 The Revenger kills 2 more. Feora manages to kill my assassin with her spray this time. 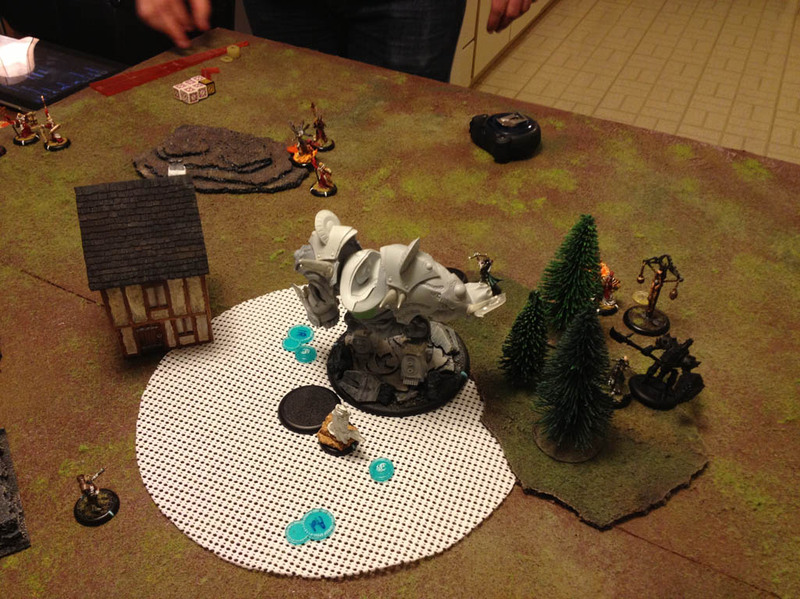 Hyperion charges in and kills the Vanquisher. 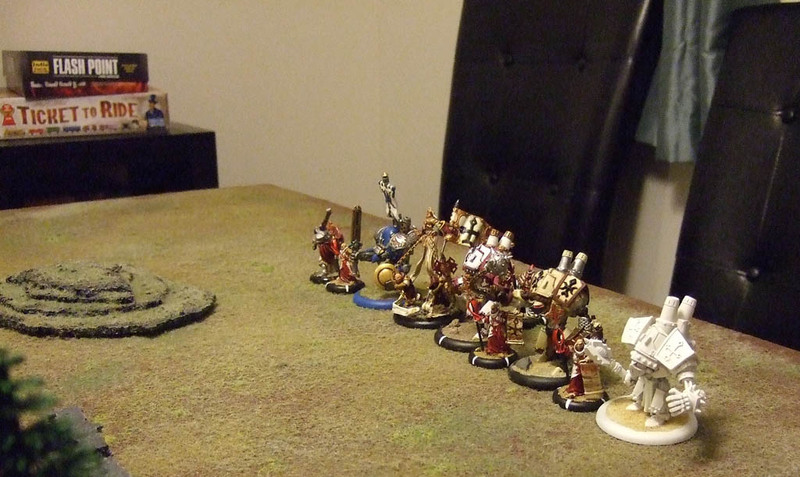 Issyria ancillary attacks with the sparkleburst cannon and kills 2 choir and the last vassal. 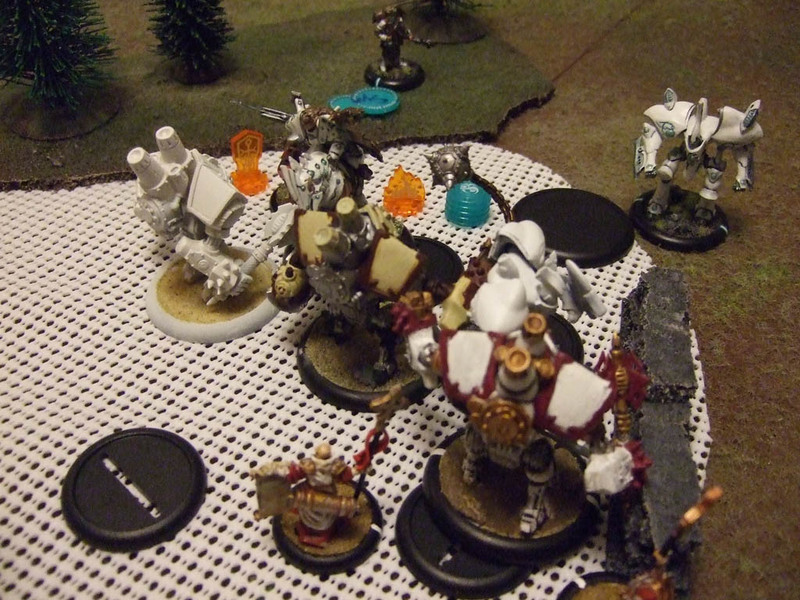 Issyria tries her best to hid behind Hyperion and toe into a wreck marker for some protection. 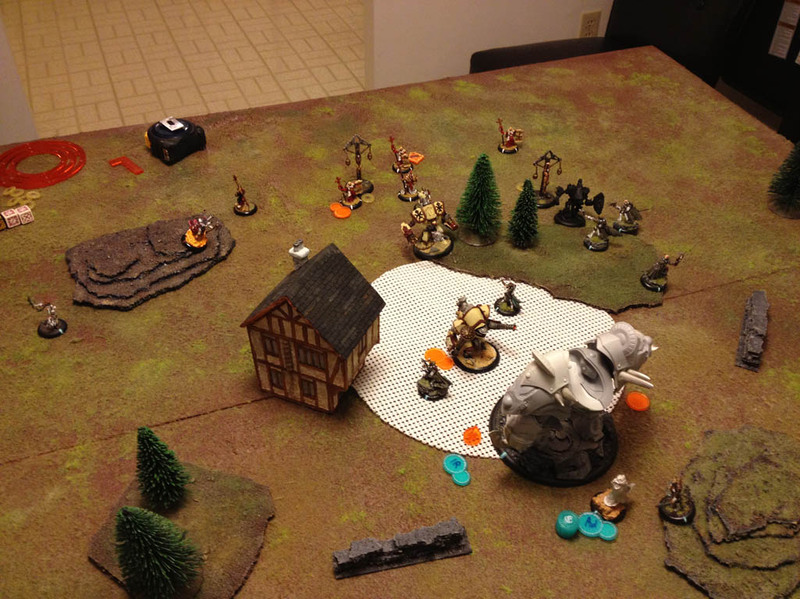 Continuous fire comes around and Marc needs a 6 to kill Issyria and roooooollllllllsssss…… a 7. 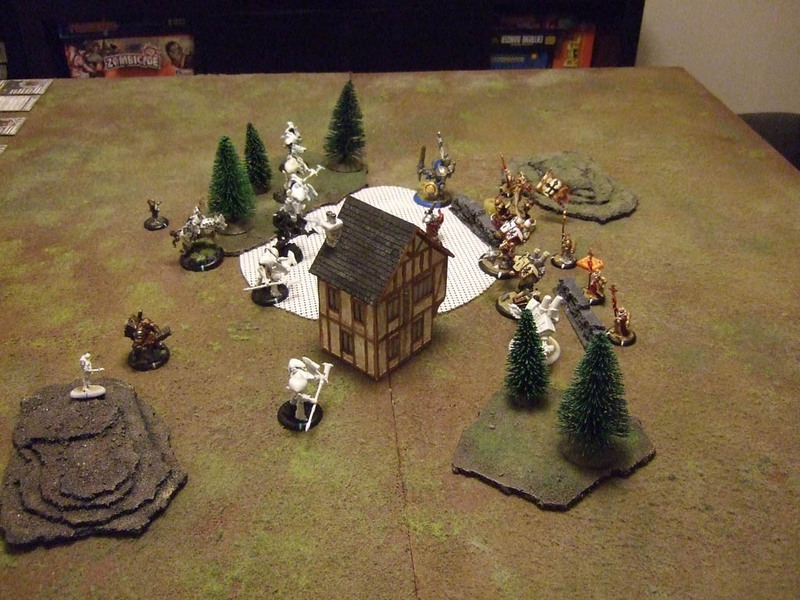 Victory to Menoth! Boo!! attrition game but actually have the ability to do work themselves. In particular I think Issyria loses a lot of game at low point levels since there isn’t enough army to do work for her. I can’t wait to give her a try at higher point levels. As usual any comments on our tactics, list building or the strange noises it makes when we sit down are more than welcome. 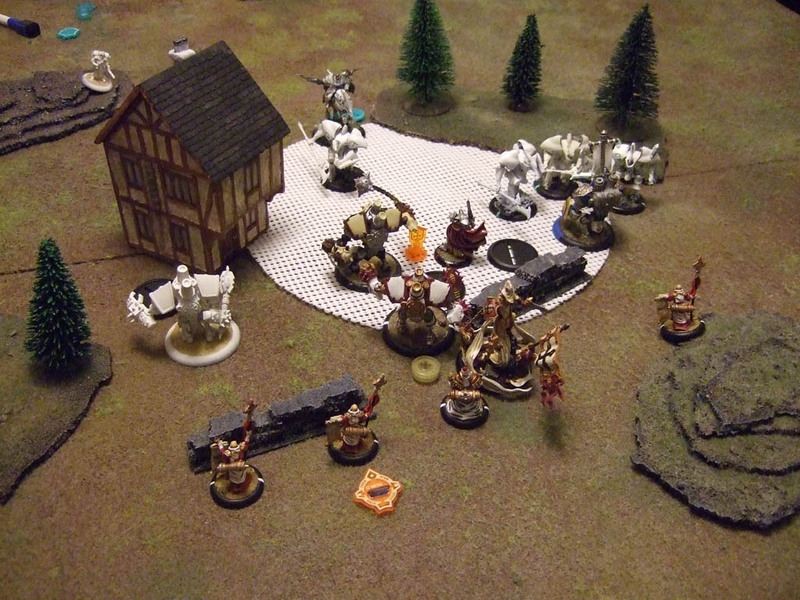 This entry was posted in Battle Reports, Harbinger, Menoth, Retribution, Vyros and tagged batreps, Protectorate by Nick. Bookmark the permalink. It’s an interesting thing with eVyros, the amount of Griffons you have is ideal it just seems like there were not enough enemies on the board to effectively build the synergy chain. (And still have favourable trades happening.) 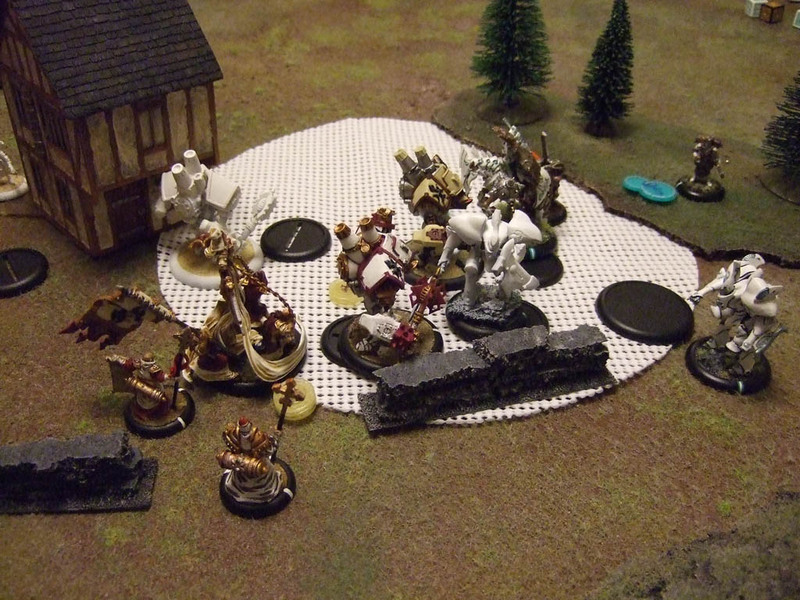 I only say this because, at 50 points I run seven Griffons an Aspis and a Manticore. The Griffon that does the work gets concentrated power and the rest build up. I feel for you with Issyria, she really needs higher points to shine. With no choir to take out half of your armies effectiveness. Well… you forgot that eFeora Feated, got back 3 Focus, and boost to hit Issyria with a 3rd spell (Convection, I think), which you were out of Focus to “Arcane Vortex” away… but I missed (needed 14 on 3d6? ), so no real harm there. 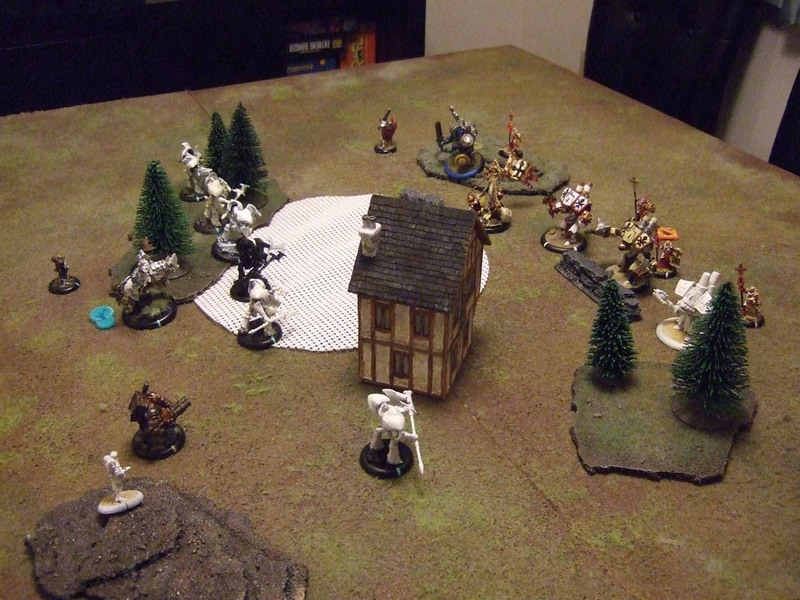 It also let me transfer the Fire-token from Hyperion to your last MHSF, which was a nice Menoth-farewell to that unit. I made a bunch of rookie mistakes… not keeping the Vassals B2B with warjacks before Hyperion was in range was silly of me (DEF15, ARM15 is a lot harder for MHSF to kill than DEF13, ARM13! ), counting on eFeora to hit that MHA with a single Spray was basically suicidal (I could’ve at least try to Fire-Step into range and use melee attacks… much more likely to hit! )… I’m sure there are others. But a lot of fun, regardless! Lastly… Issyria is neat. You never used her Feat (you didn’t really need it), but she is super-fragile. I think she would benefit a lot from both a Hyperion and AFG in her list… 2 huge bases to hide behind, and the AFG on Feat Turn can probably do some pretty heavy lifting.